The Vaptio Super Bat 220W TC Kit integrates dual 18650 batteries with 220W of maximum power and futuristic bat hero appearance design to pair with the new Frogman Sub-Ohm Tank. 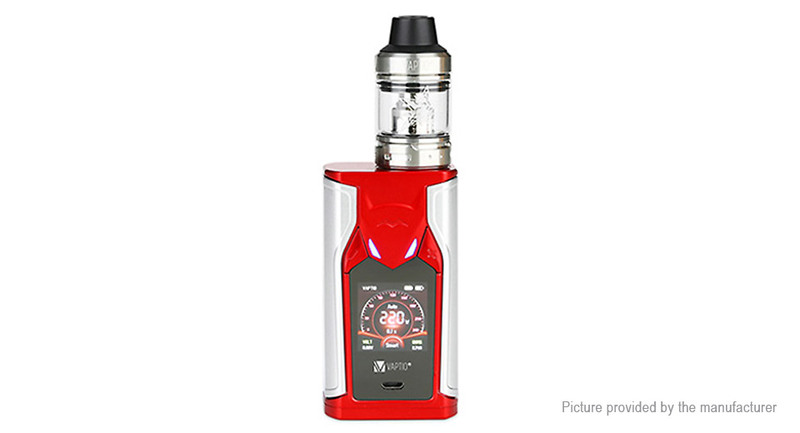 The Super Bat 220W Box Mod features the new Super power with fingertip control, delivering a tremendous output range of 1 to 220W with comprehensive temperature control. The &apos;Bat Hero&apos; design sports a colorful and interactive LED lighting display. Super Bat comes with large 1.3 inch high-definition screen provides fully intuitive arrangements and layouts, working in synergy with the ergonomic adjustment buttons. Pairing with the device is the latest Frogman Sub-Ohm Tank, featuring a 26.5mm diameter base with Child lock design, large bottom airflow control, and easy top refill system. The Vaptio Super Bat Kit never will you down!